To succeed in this world, you have to change all the time... focus on something the customer wants, and then deliver it. I recently took my neice to visit the Cutty Sark. A local tourist destination in a beautiful setting in South London. I have walked and driven by the historical boat hundreds of times without ever taking one of the tours to see for myself its rich and celebrated history. Watching the videos and checking the timeline of the ship got me to thinking about innovation and the constant need to find and add value in the services you provide as a business. In short, the Cutty Sark was like the Seabiscuit of the seas. A fast ship built in Scotland that was renowned for the speed with which it could get to China and back as a transporter of tea - helping create the tea trade that is booming today in the UK. It was the little ship that could. Only a few years into its successful tea transporting, the Suez Canal opened up and steam ships became the dominant force in tea trading. 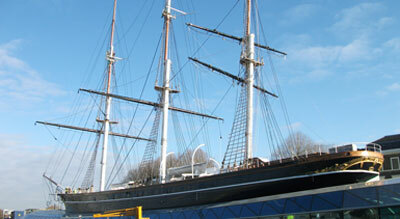 The Cutty Sark then found a new use in transporting wool from Australia. Once again, the ship was famed for the speed of its voyages. Steam ships again came to the fore in wool transport from Australia and the Cutty sark won less and less business in this area and became an general cargo ship, used for a variety of items transport. Even this ceased as ship technology further improved. The ship was used as a cadet training ship by the British Navy for a period before outliving this use and becoming the docked tourist piece it is today in Greenwich. In the hyper speed world of tech start-ups of today, technology services improve and innovate continuosly and the pace of change can catch many businesses and start-ups unawares and the lack of awareness or foresight can mean lost sales, lost market share, poor customer or potential customer perception, and - of course - eventual demise due to shrivelled revenue or traction, or - even worse - a start-up product never doing anything by virtue of being DoL (dead on launch: redundant or short-term product or service deemed unecessary or irrelevant as soon as it is launched). Like the owners of the Cutty sark, it is vitally important to assess the need and appetite of the customer and the customer market and look for opportunities to re-invent or re-position where necessary. Times change and you need to move with them. Rather than being abandoned and scrapped, the Cutty Sark is around and earning its keep more than 100 years after creation. That's a vast amount of time, but what is the timespan of your product or service? Woolworths, Blockbuster and X didn't keep abreast of their customer preferences and pivot or re-position successfully and they have gone the way of the Dodo. Have Kodak and Blackberry adjusted their goggles and their efforts in time to be spoken about as operating and commercially sound or successful businesses of the next 10 years? The immediate future will determine. Another popular example is Nokia. The one-time king of the mobile phone market, they were caught standing still by the emergence of the sophisticated smartphones from Apple and then a posse of Android-using manufacturers. Stubbornness, inertia and pride may have all played a factor in Nokia not opting to develop Android-based smartphones to challenge Apple. Nokia's smartphone business dwindled from being the number 1 manufacturer to being a distant also-ran and then eventually being sold to Microsoft - nokia Smartphone's died a death. Nokia still exists and is showing green shoots of growth...they have developed a tablet computer based on Android...have they looked around the corner and seen the right path to take? For you, and the benefit of your business, make a plan to keep an eye on the future of your marketplace. Take the time to develop your own checklists.